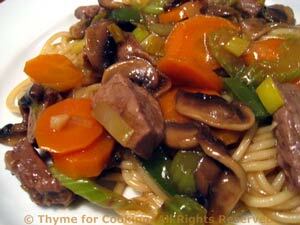 Dinner tonight: Beef and Mushroom Lo Mein. Use any beef suitable for stir-frying. Often supermarkets will have it packaged as such. Or substitute chicken, pork or turkey. Stir-fries are flexible! We use flank steak, sliced thinly on the bias. One of the tenants of most Asian cuisines is that the food should be attractive: pleasing to the eye as well as the palate. One way to achieve this is to make certain that your ingredients are colorful; another is to cut the ingredients into varied shapes. This Lo Mein is as delicious as it is pretty. Cut the beef at an angle across the grain into bite-size strips. Mix sesame oil with 1 tsp soy sauce. Toss with beef and set aside to marinate. Clean and thinly slice leeks. Cut the pepper into matchsticks. Slice the celery thinly, at an angle. Slice carrot into thin rounds. Heat 1 tsp olive oil in large nonstick skillet over medium-high heat. Add mushrooms and sauté 3 - 5 minutes, until they start to brown. Remove to a plate and set aside. Add 1/2 tsp oil and leeks to skillet, stir-fry for 3 minutes. Add garlic and ginger, stir-fry another 2 minutes. Remove leeks/garlic to plate with mushrooms. Add 1/2 tsp oil, carrot, pepper, celery to skillet and stir-fry 3 minutes. Remove to plate with other vegetables. Add beef to skillet and stir-fry 3 minutes, until brown. Bring to a boil, cover and simmer for 3 - 4 minutes. Dissolve cornstarch in soy sauce. Uncover skillet and add cornstarch mixture, stirring until thickened. Put pasta into a large bowl. Pour beef mixture over top, toss to combine and serve.